Colemak: Learn in 9 Days! Learn Colemak in 9 Days! 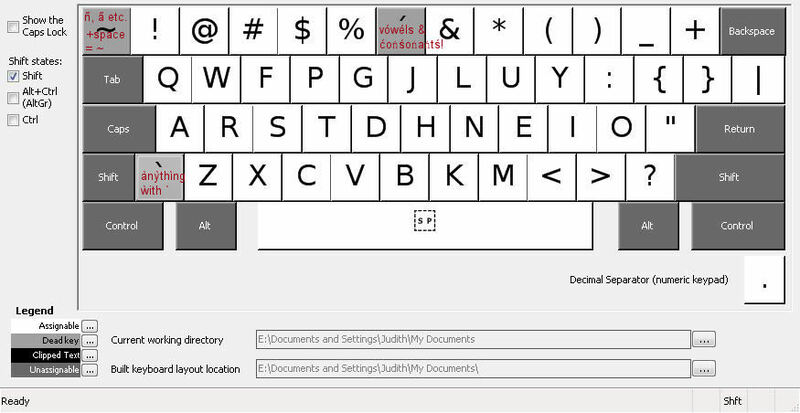 Judith created an implementation of Colemak for Windows that is much better for people who regularly need to type accented letters - for example speakers or students of French, German, Italian, Spanish, Swedish, Portuguese or even Esperanto or Maori. Download it here. Rationale: With the standard Colemak implementation, you invariably have to press Alt Gr and something else, often even two things, to get your accent letters. Yet, depending on the language, some of these accented letters may be among the most common letters in the language, and Alt Gr combinations with right-hand keys could not be more inconvenient, forcing you to twist your hand or leave the standard position. This is why another solution for international Colemak users is necessary. The QWERTY solution to the same problem is to have several dozen different implementations of QWERTY / QWERTZ / AZERTY, at least one for each language and country. This is unnatural and hinders multilingual people from reaching their full typing speed, as almost every new language learned requires the memorization of a different layout for punctuation at least, either that or memorizing Alt+number codes to type common accented letters on a keyboard not made for that language. Hence the goal was to create just ONE keyboard layout that can support as many languages' accent keys in comfortable positions as possible. As there are way too many possible types of accents to fit them all on the same keyboard using just regular and shift keys, it was decided to focus on covering Romance, Celtic and Germanic languages. Special accents for Slavic, Baltic and Turkic languages still require the Alt Gr key and should get a separate implementation of the Colemak keyboard. Goal: To create one Colemak-based keyboard layout that allows speakers of ANY Romance or Germanic language to type their language without needing the Alt Gr key, and to comfortably switch between languages in writing without having to switch keyboard layouts. Method: The Colemak layout should be disturbed as little as possible, so that no re-learning would be necessary. This means that the Alt Gr-based accent deadkeys still work, and all the letters and punctuation marks were left in their designated spot, even though it might make sense for one language's accent deadkey to be on the home row for example, if accented letters are really common. But then the implementation would also take a national character and would be unsuitable to anybody not typing in that language, or to people who already learned Colemak. So the accent marks can be found on fringes of the keyboard: on the bottom-row key next to shift, on the key above tab, and replacing the - and ^ keys (one of those keys + space still gives you the original). Result: Pictures of the implementation - plain, shift, Alt Gr. All Romance, Celtic and Germanic languages (including Afrikaans) can now comfortably be typed. As a side effect, this layout also fully supports Albanian, Esperanto, Filipino, Hawaiian, Kurdish, Latin and Maori. Additionally, all Slavic, Baltic and Turkic languages can also be typed more easily with this layout than with plain Colemak; just some of their diacritics remain behind Alt Gr. And if I only want to type English? 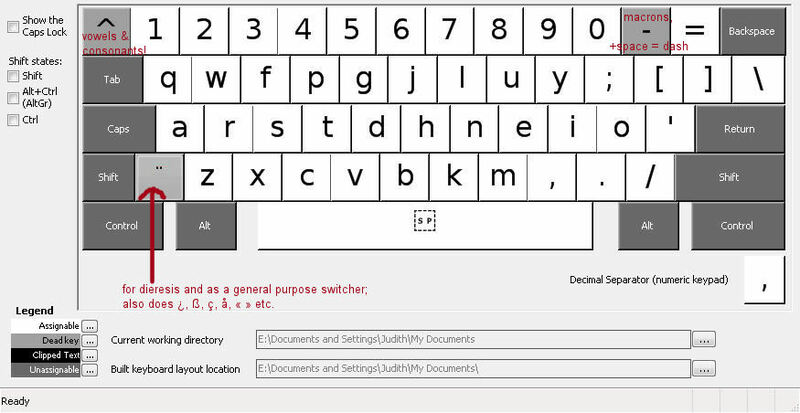 2. you have to use the minus key for a dash or type an extra space after "-". 2. you can type international/English words like "�ber" or "d�j� vu"